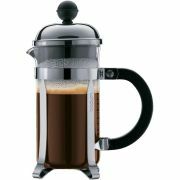 A french press is a simple method of brewing good full bodied coffee. In a french press the coffee is completely immersed in water, and the ground coffee is filtered using a metal filter. This way more oils and fat from the coffee, together with more flavor particles stay in the coffee compared with traditional brewing with a paper filter. 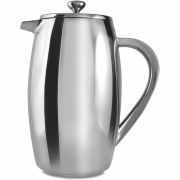 The french press has traditionally been used in France, where it is called cafetière. The name can be a bit misleading, but the coffee brewed with a french press has nothing to do with espresso. Read our guide for brewing perfect coffee with the french press!